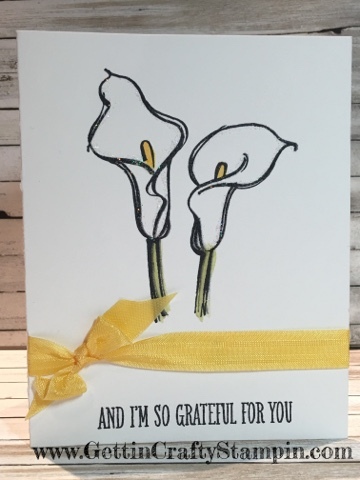 Create a simple, classic and elegant card to show your gratitude. This stunning stamp set is perfect for coloring, like this easy water coloring look. A hand-stamped card is a great way to show your gratitude. Join Us in creating and sending love with hand-crafted cards at our card making classes. I love the ease of this hand-crafted card. The Aqua Pens make for easy and fun water coloring! Using the Black Archival ink pad (that doesn't run when used in water coloring and stamps a true sharp black) to stamp this lovely Calla Lilly from the Remarkable You stamp set. The new THICK Whisper White card stock ROCKS! Strong, stands up to embossing, water coloring and more - it feels luxurious in your hands, too! Using the Aqua Pens with the Daffodil Delight and Old Olive ink pads. Add a little wow factor when you highlight the Calla Lilly with the liquid Dazzling Details liquid glitter. Tie on this coordinating Daffodil Delight ribbon and BAM - done!! So easy but the results are just lovely! Created at a recent card making class, this water colored card was a hit! Super easy, elegant and fun to create. The ease and beauty of this quick hand-crafted card had it as a favorite from the card making class. 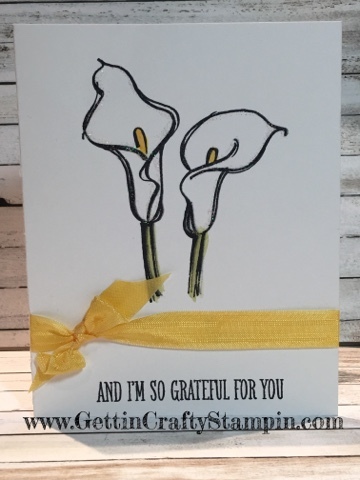 Tell someone how you feel, how you appreciate them with a hand-stamped, water colored card like this!